Six years ago, I returned to Portland after three months abroad–a trip that was the result of quitting my job to take a much-needed break, reassess my priorities, and also satisfy some of my travel cravings. Upon my return, I didn’t feel a great deal of anxiety about the prospect of unemployment. I knew the right opportunity would come in its own time, and I just needed to be patient. That opportunity did come, and a lot quicker than I had hoped. Today, I feel like I am on the other end of a full circle. After six years at the same contract position, it came to an end just last week. Once again, I don’t feel particularly anxious because I know the right opportunity will come. For now, I’m enjoying my unemployment and kicking it off with a visit to a place I’ve been a few times before, Esalen. Ahhhh, Esalen. 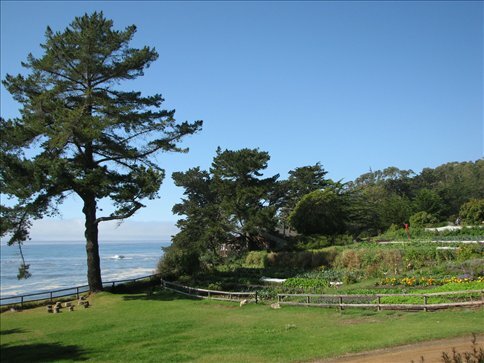 If you’ve been ‘traveling’ with me for awhile, you might recall that I wrote about my first trip to Esalen several years ago. I came here for a yoga retreat, was utterly captivated by its magic, and here I am four years later on my third yoga retreat. Although it’s been two years since my last visit, when I arrived I felt as though hardly any time had passed–as though it were two months instead of two years. From the moment I entered the grounds I felt immediately awash with a smell that I associate only with this place: an intoxicating combination of fresh pine, eucalyptus, and salty sea air. In that moment, the sky was a brilliant shade of blue, the temperature warm, and a light breeze played upon my face. The energy both around and within switched immediately to something more peaceful, as though the very air I breathed filled me with a feeling of alright-ness. That’s the magic of Esalen. It holds a timeless place in my heart and mind, a place full of satisfying smells and sensations–a place that is usually reserved for places like home. I suppose that in some way, Esalen feels to me like returning home, but better. It’s a place where I don’t need to worry about the normal cares of my life. A place where all of my needs are met, so all I have left is to pay attention to my own rejuvenation. It’s a step outside of the world as I know it.